This is a more recent post than some of the others I have pulled from the archives. It is not a strait forward reposting because I have made a few changes here and there and added some more pictures to make the anatomy a little more understandable (I hope). For those of you who do not know much about human skeletal anatomy, I am thinking about starting a weekly series on the human skeleton – feedback would be appreciated on that. Mladec is an upper paleolithic site in central Europe. The material from the site was first descibed in 1925 by J. Szombathy. The site was dated to approximately 30,000-33,000 years BP based on archaeological grounds – which puts it as a contemporary of Skhul and Qafzeh. At least eight crania, some mandibles and postcrania have been discovered. Below is a picture of one of the crania (Mladec 1 if I’m not mistaken) and one of the fragments (part of a maxilla). 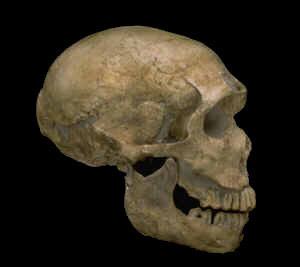 Below that is a picture of Skhul 5 – a neanderthal skull. Mladec 2, on the other hand, lacks a supraorbital torus, has large mastoids and the back of the cranium is higher and rounder (I should mention that Mladec 1 and 2 are both females). 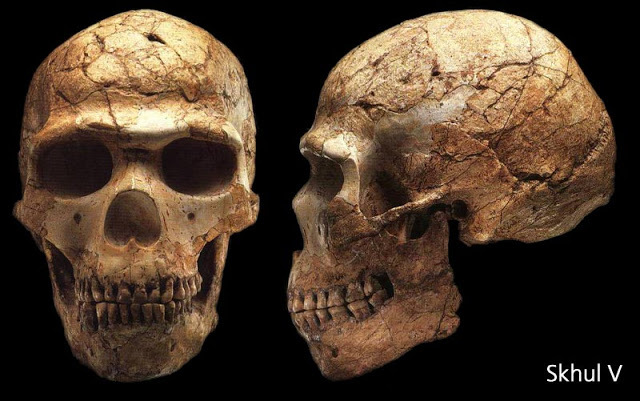 Both skulls are quite robust compared to later upper Paleolithic skulls. 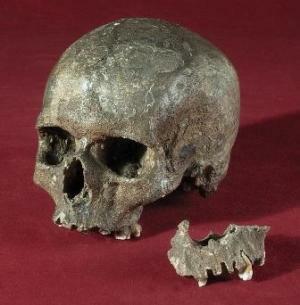 The male skulls from Mladec are somewhat archaic in appearance. They have low braincases, thick cranial bones and large supraorbitals. They do, however have small mastoids (small mastoids are a characteristic of neanderthals not anatomically modern humans).They also have a certain amount of facial prognathism – approaching that of neanderthals. The nasal aperture is broad – a neanderthal characteristic also. Recently the Mladec material was dated directly, via radiocarbon dating. Generally, when an artifact or skeletal material is dated it is indirectly. Usually organic material – such as charcoal – that is in association with the artifact or skeleton is dated. In this case some of the teeth were radiocarbon dated (to approximately 31,000 BP). Why is this important? The MladeÄ remains are universally accepted as those of early modern humans. However, there has been an ongoing debate as to whether they exhibit also distinctive archaic features, indicative of some degree of Neandertal ancestry, or are morphologically aligned solely with recent humans and therefore document only a dispersal of modern humans into Europe. … a rather convincing case could be made for the hypothesis that the earliest modern sapiens samples represent a morphological transition between Neandertals and later sapiens populations. More recently eastern European authors…have suggested that the evolutionary sequences in this area can best be interpreted as the result of frequency changes in characteristics already present in Neandertal populations. Essentially, Wolpoff is arguing that the kinds of things we see in other transitions – such as the dinosaur/bird or dinosaur reptile/mammal transition also apply to human evolution. For example in the dinosaur/bird transition there were a wide variety of dinosaurs with traits that would later be characteristic of birds – but they were not all combined in one dinosaur. One could say the same about the dinosaur reptile/mammal transition. 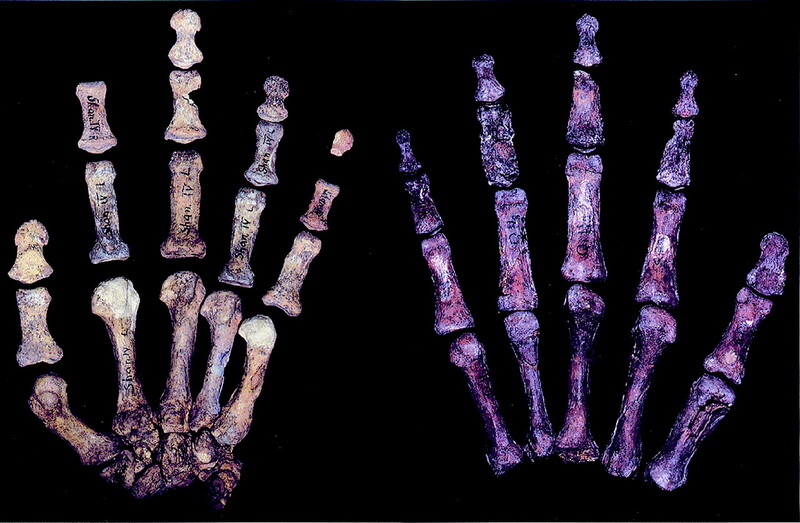 One of the other reasons that Mladec is important is that, as mentioned above, the skeletal material represents males, females, juveniles and adults. In other words it represents a population. Understanding populational variability will help us gain a better understanding of human evolution. 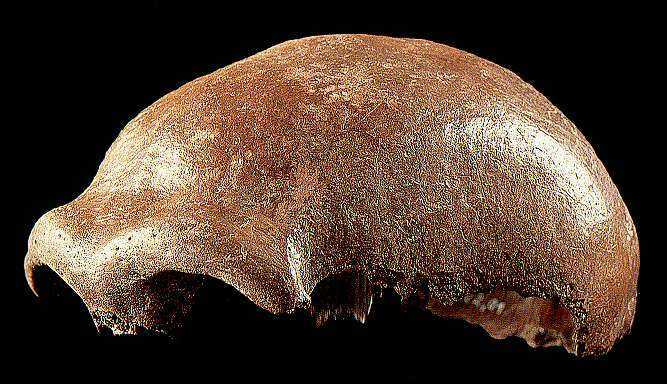 This is Neanderthal 1 – note the supraorbital ridges. This is La Ferrassie 1 – note the occipital bun, supraorbitals and small mastoid. (p.s. I think you mean “reptile/mammal” transition where you have “dinosaur/mammal” transition)! Are there any ideas regarding why there might have been such apparently pronounced sexual dimorphism in the Mladec skulls? From the way you make it sound, the female specimens favor the characters found in modern humans while the males are much more similar to Neanderthals. Has anyone suggested why the variation is divided along sexual lines?